♥ Mama 2 Multiples ♥: Costume Super Center: The Hulk Costume Review! 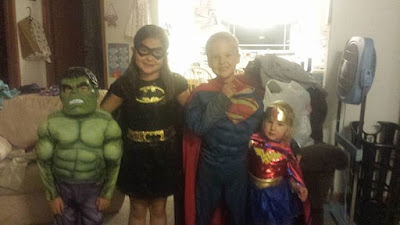 I have done several reviews and even some giveaways for various costume websites. These reviews have got to be among my kiddo's favorite ones that I participate in because -- clearly -- they get free, cool costumes! 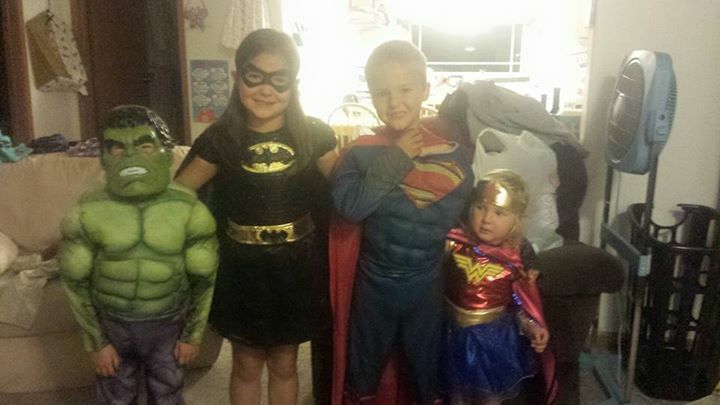 We decided on a Superhero theme this year. If you know me, you know I am fully taking advantage of the years I get to choose my kiddo's costumes. I know one day they won't let me do that, so while I still can, I am soaking it up! I LOVE doing themes with my children! We have done a Cat in the Hat theme, Wizard of Oz, Alice in Wonderland, and Peter Pan so far and each year we get so many compliments from friends, family, and even complete strangers on our thoughtful costumes and neat themes for my 4 kiddos. 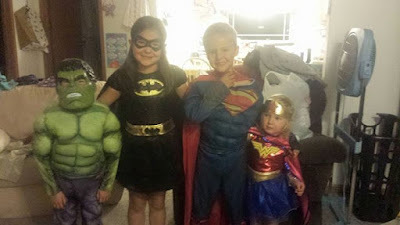 The boys were very much into the Superhero theme this year! Connor and Mason are very much into the Avengers, Transformers, and all things hero and boy related! Costume SuperCenter has so many Avengers costumes to choose from, among many others! Mason could not wait to get his costume on when it finally came in! It was difficult to make him sit still long enough to get too many photos of him in it though but I did manage to get some group shots of him and his siblings all in their costumes too! Is he cute or what?! He absolutely adores this costume! He was upset when he had to take it off but he will get plenty of chances to wear it at upcoming Halloween parties and of course, the main event at the end of the month. I can't thank Costume Super Center enough for working with me on this review! This costume is easy to use as it comes in all one piece (except for the mask of course!) It's nice that it is all one piece and that it will be fairly warm for Mason, since Vermont Octobers are known to be pretty darn cold! While it is warm enough as it is, we always put pajamas on underneath the kiddos costumes, and with this one, there is plenty of room to do that without hindering the true look and feel of the costume itself. At first I worried that the mask would be cheaply made, like a lot of monster masks you find in stores but I was wrong! This mask is nice, thick, and comfortable for little Mason, which is the most important factor! All in all, we are both very satisfied with this costume and greatly looking forward to our Halloween festivities this year! 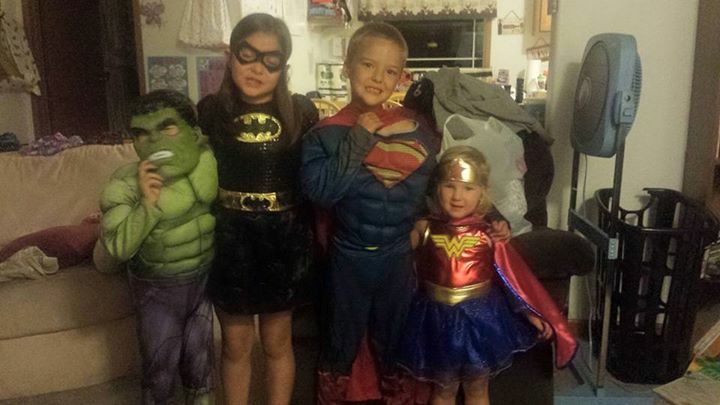 For all of your Halloween costume needs, head over to Costume Super Center's website and their follow Costume Super Center on Facebook for all the latest news, updates, and deals! This costume is so nice. 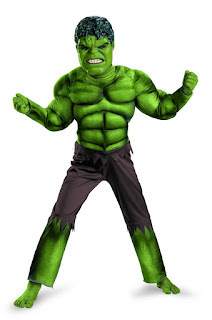 Hulk is always a popular choice among kids for costumes. Maybe it is because it makes you feel so powerful.